Vitali Klitschko has emerged victorious again, as he took a one-sided, 12 round unanimous decision victory over Kevin Johnson. The official judges scored the bout 120-108 twice and 119-109. With the win, Klitschko improved to 39-2, 37 KO's. Since 2000, Klitschko has won 12 of 13 bouts, with the only loss coming against Lennox Lewis (TKO 6), when he suffered a severe cut above his left eye and the bout was stopped. Kevin Johnson falls to (22-1-1, 9 KO's). In the 1st round, Klitschko pressed forward and threw a blinding left jab. For the duration of the fight, Johnson was hesistant to let his hands go. Johnson is known to be a defensive fighter, but Klitschko still imposed his will on him. Klitschko connected with a right hand lead as Johnson was leaning back against the ropes. In the 2nd round, Johnson caught Klitschko with a right, but Klitschko continued to pop his jab. Then, Klitschko landed a right hand and followed it with left hook leads. He also hit Johnson with right hands behind the jab. Moving ahead to the 6th round, Klitschko landed a hard right to the body and continued to get his punches off first. Johnson was trying to dodge many of Klitschko's punches, and could not land many of his own. In the 9th round, Klitschko caught Johnson again with the overhand right. Heading into the 11th round, Klitschko was in total control of the fight. He was dominating Johnson with the jab and firing rights. Klitschko's height and reach advantage was too much for Johnson to overcome. Johnson lacked a solid offensive output, which led Klitschko to dominate the fight. 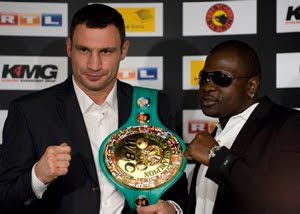 Who will challenge Vitali next? Will he ever be defeated again? Is there anyone out there, who poses a dangerous risk to him? Fans and sports betting entities alike are dying to find out. Odlanier Solis could be Vitali Klitschko's next opponent. Solis is 15-0, 11 KO's and has 231 amateur fights to his credit. Solis is a six-time Cuban National Champion (1999-2004). In 2004, Solis won Olympic gold in the heavyweight division in Athens, Greece. Solis is listed at 6' 1" inches tall with a 73" inch reach. However, Klitschko is 6' 7 1/2" inches tall with an 80" inch reach advantage. 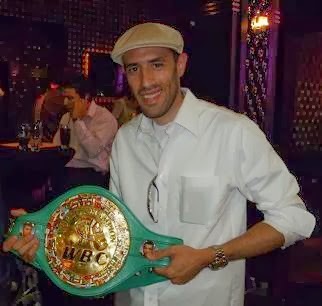 How would Solis plan to battle Klitschko?